Coq de Leon Roosters are reknowned throughout the world for their excellent tailing characteristics of a naturally stiff yet supple fiber. Many synthetic materials are too stiff and will puncture the surface film causing the dry fly to sink. Coq de Leon feathers provide the glossy, resiliency qualities that mimic the natural and allow the dry fly to float for a better performance. 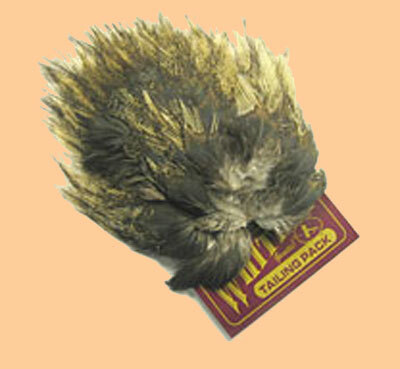 Once, only found in Spain, these tailing feathers are now available domestically through Whiting Farms. Whiting has obtained the original Coq de Leon breeding stock and has raised these birds since the mid-1990's. 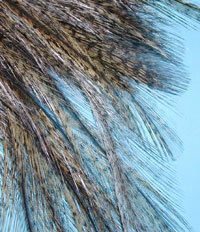 The Coq de Leon tailing feathers are speckled throughout and come in three Brown and Black colorations known as Pardo. Whiting also provides a number of natural colors from their Herbert/Miner line in Light Ginger, Black, and White. Additional dyed colors are available in Light, Medium, and Dark Dun. See Color Chart .